Valentine’s Day is simply not the same if you don’t celebrate it with the basics, chocolate and strawberries. The best part is that they are effortless to make and amazingly delicious. The bad part is that strawberries are not in season here in the US in the winter and you end up paying a lot more than what you pay when they are in season. I say bite the bullet and make them anyway, they make everyone happy and that’s all that matters. In this recipe I’m using milk and white chocolate but you can use any kind of chocolate you want. I’m also using chocolate sprinkles and chopped pecans to give them different looks. Get creative with them, use different color sprinkles and all kinds of toppings to add unique textures and designs. The possibilities are endless and you’ll have a great time making them. For this recipe I’m collaborating with Angela Kim who is the creator of a really great cooking channel on YouTube called The Squishy Monster, how cute is that name? There, you will find many, and I mean, many sweet recipes as well as traditional Korean recipes, if you want to expand your culinary knowledge. 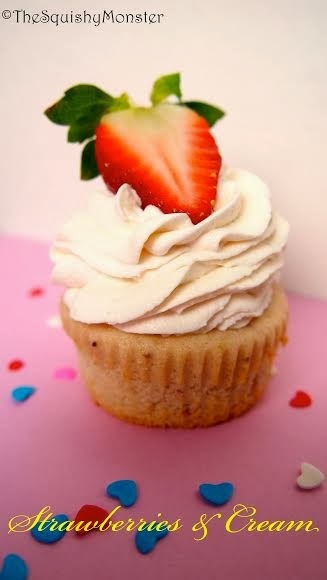 In her collaboration, Angela will show you how to make strawberries and cream cupcakes, another great dessert to celebrate Valentine’s Day, don’t you think? Below I have left her video so you can check it out. 1. Place either the milk chocolate or white chocolate in a medium size bowl. 2. Fill up a medium pot with about 1 inch (2.5 cm) of water and bring it to a boil. 3. Place the bowl with the chocolate on top of the pot making sure the water does not touch the bowl. Stir until the steam melt all the chocolate morsels. Process continues in step 4 below. 2. Place the bowl with the chocolate in the microwave for 30 seconds. 3. Take out the bowl from the microwave and stir. Keep doing this process in 30 second intervals until all the chocolate morsels have melted. 4. 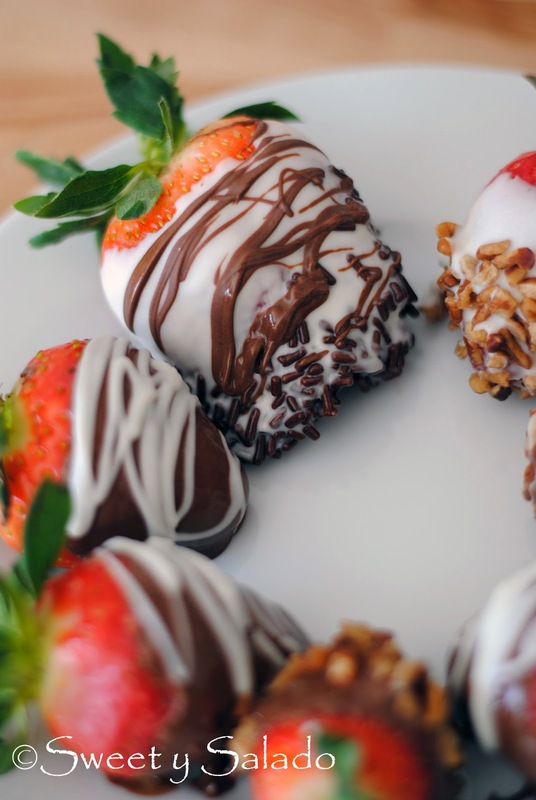 Hold the strawberries from the leaves and dip them into the chocolate. Make sure all sides are covered, let the excess chocolate drip off and place them on wax or parchment paper to dry. 5. To decorate them, you can dip them in the sprinkles or chopped pecans after covering them with the chocolate. 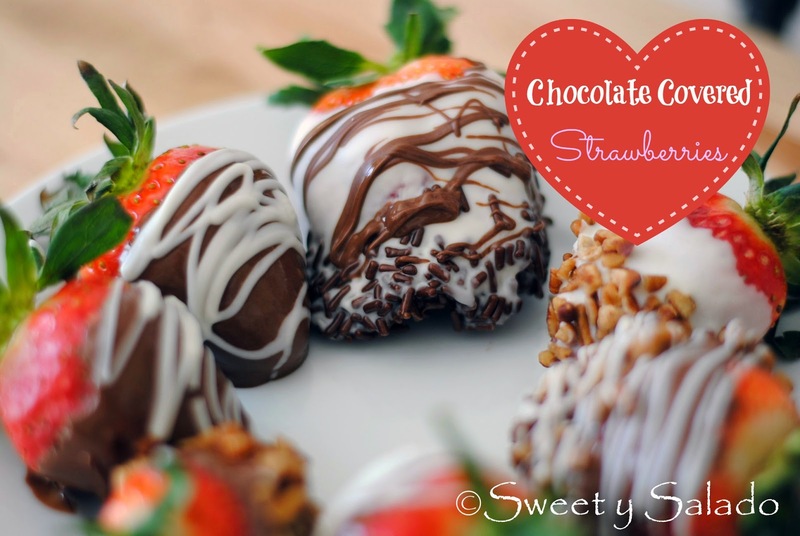 You can also drizzle the milk chocolate strawberries after they have dried with the white chocolate by dipping a fork in the white chocolate and waving it quickly over each strawberry. Use the same technique to decorate the white chocolate strawberries with the fork dipped in the milk chocolate. 6. Let all the strawberries set at room temperature and serve. Do not store them in the refrigerator or make them the day before because condensation will from between the strawberries and the chocolate and this will make them separate. So would you recommend to make the strawberries two days before valentines day? No, I do not. It's best to make the the day you're going to consume them because if you refrigerate them, they will start to sweat and this will make the chocolate separate from the strawberries. If you leave them out at room temperature, the chocolate will not be as hard and it will also draw out the sugar from the strawberries.